You stitched your clothes with feathers. for the harvest of birds. to the gray bounds of sea and sky. Trusting your life not to slip. you lived your life in and out of it. broken by the world that is not this place. everything that kept you breathing. wool-heavy on the hills so empty of you. 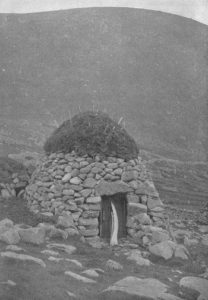 photo is “Cleit for storing fuel or hay on St Kilda” by Richard Keaton, Dec. 31, 1897.